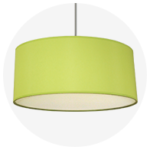 Widely recognised as the leading supplier of drum lamp shades online and throughout the UK we pride ourselves on offering first class service to our broad customer base. 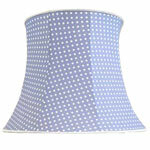 We have been supplying drum lamp shades to residential and trade customers for over 50 years. As a drum lamp shade manufacturer we produce both traditional and modern drum lamp shade styles from our workshop in Devon. Examples of our work can be found at Windsor Castle, QM2 and sister ships, The Orient Express as well as numerous TV & film sets to name but a few prestigious clients we work with. Please call us to discuss your drum lampshade requirements in more detail. Modern drum lamp shades are also known as hard shades, these consist of the outer fabric being laminated to a PVC backing, its this PVC that gives hard drum lampshades a clear crisp finish. The drum shade its self consist of a top and bottom wire ring that the laminated fabric is formed to. 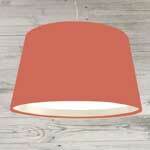 This style of drum lampshades is the most popular shade sold on line in the UK. 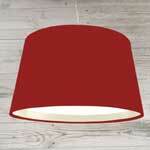 Examples of our most popular drum lampshades can be found by clicking here. 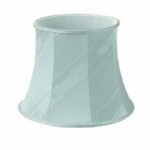 Traditional drum shades also referred to as soft shades are made up of a rigid wire frame with a stretched fabric cover. This style of drum shade tends to be bowed or tapered which is not a shape that can be achieved with the modern PVC drum shades. The traditional style of drum lamp shade is also trimmed top and bottom and can be lined with fabric giving a softer light. The versatility of the drum lamp shade makes it by far the most popular style of lampshade purchased throughout the UK both online and on the high street. Drum lamp shades have grown increasingly popular as feature lights in both residential and commercial settings, often manufactured in bold colours or prints to create a dramatic statement. Specialising in the manufacture and supply of custom made drum lamp shades to both residential and trade customers we are pleased to offer the broadest selection of drum lampshades available anywhere within the UK. 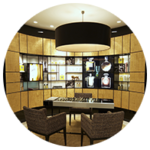 Imperial Lighting is a family run business that has been supplying stunning drum lampshades for over 50 years to both retail and trade customers. 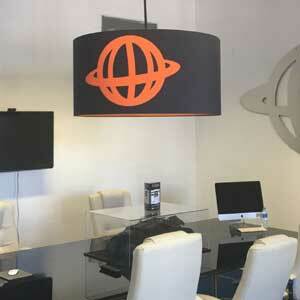 Examples of our drum lampshades can be found in private homes, high street outlets, hotel chains and cruise ships. Our custom made drum lamp shades are available from small candle drum lampshades through to extra large drum lampshades of 2m plus sizes for commercial projects and can be found gracing the high street from NatWest Banks, Tesco and Mothercare to Harrods. From our drum lampshade workshop in Devon we hold over 250 stocked drum lampshade fabrics from cotton's to Linen and Silk Dupion in addition we can manufacture drum lampshades in customers own fabric, wallpaper as well as offering a digital print service enabling you to create a truly one off drum lampshade. All drum lampshades can also be lined in matching or contrasting fabric taken from our drum lampshade swatch or from our metallic range of golds, silver, bronze and copper. 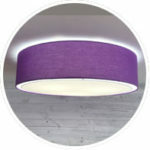 Our stunning range of flush drum lamp shades are handmade to order in any of our stocked fabric's as well as in customer own material or digital print. 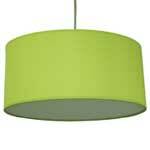 The flush drum lamp shade comes complete with ceiling fixing that incorporates a 3 or 4 light fitting. The flush drum lamp shade is the perfect solution to rooms with low ceilings such as new build properties and hotel corridors. As you can see from the flush drum image, the flush drum lamp shade has a rolled edge finish and integrated white PVC diffuser. When illuminated the flush drum lamp shades gives a soft halo effect of light on to the ceiling. 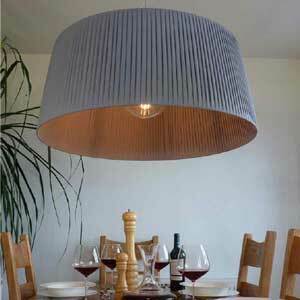 A stylish alternative to the straight sided drum shade the French drum lampshade has become increasingly popular. This elegant style of drum lamp shade suits table lamps, floor lamps as well as a pendant light. Our latest range of E|clipse french drums are avilbale in your own fabric and can be paired with some stunning metallic linings. 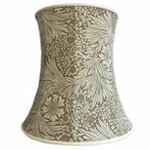 visit our french drum lamp shade page to view the full range. 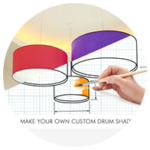 Our online drum lamp shade builder is a simple step by step process that enables you to create your perfect drum lamp shade in minutes. Start by selecting your preferred drum lamp shade shape and selecting the size and whether the drum lampshade is for a table lamp floor lamp or to hang as a pendant drum lampshade. Once you have made these selections you can then browse our huge section of drum lampshade fabrics made up of over 50 cottons, 20 plus linen and 250 of the finest silk dupions. 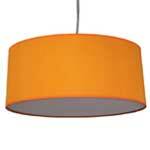 If opting for a pendant drum lampshade we also offer a couple of drum lampshade diffusers. A layin diffuser that covers the entire bottom of the drum lampshade and a floating diffuser which is normally made 100mm smaller than the shade which floats inside the bottom ring of the drum lampshade (hence the name). Drum lampshades benifit from a diffuser as it does help to soften and hide the light source. Not technically drum lampshades but we think these 1500mm dia triangles that include a colour changing LED system look absolutely stunning at Europe's leading new technology innovation destination. Nokia wins best stand at the World Mobile Congress in Barcelona, We think that our printed rectangles and drum shades look fantastic. These extra large drum lampshades were manufactured in various Harris and Bute Tweed fabrics as part of the banks national re-fit. Each drum shade was also lined in tweed to match the banks interior decor. Eurostar's business lounge in Paris required new lamp shades, however due to a tight budget we had to design a unique fitting that would retro fit to the existing lamp shade. Moving away from the existing conical shape these drum lampshades gave a crisp new look at the fraction of the price of like for like replacements. 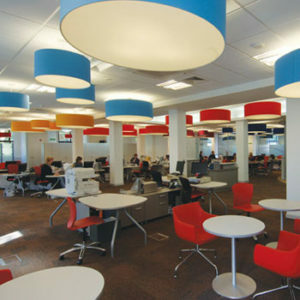 These simple red drum lampshades were manufactured to match the companies corporate colour and have been used across the retailers branches. Using drum lampshades in this way is a cost effective solution to making a bold statement. Adding a splash of colour was easily achieved by using a combination of bold colours on these extra large drum pendant lampshades. These feature drum pendant shades were made to pick up on the colour of each bedroom design, using a floating diffuser on these drum lampshades also gives a nice halo effect when the lampshades are switched on. The drum shades have been complemented with natural coloured wall lights. Over 50 black drum shades were used in Prestige Ticketing's main marquee at the London Olympics. These 1200mm diameter drum shades created the understated chic look the client was looking for. One of the most stunning developments we have visited! The fantastic interior design effortlessly blends traditional and modern in this historic building. 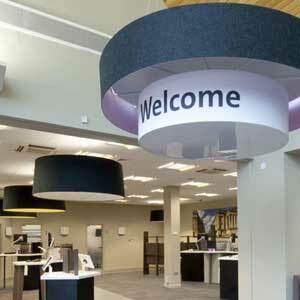 Our XL linen drum shades have been used throughout all communal areas. We are really please how well our modern drum shade blends into this setting. We love this industrial chic look that we created for Carter Jonas's office re-fits. Tall column drum shades in white canvas with a semi translucent backing give a soft silhouette light from the filament lamps, contrasted with our custom made weathered bronze outer frame. The Heskith ribbon drum shade looks stunning with a XL filament globe like the one shown here. By using a large feature bulb like this there is no need for a drum shade diffuser, this greatly reduces on going maintenance and is a favoured option for bars and restaurants. The double wrapped ribbon drum shade radiates minimal outward light, instead this drum shade concentrates downward light spill creating a cosy and intimate space. 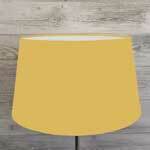 The Heskith drum shade is available in Cream, Grey, Black, Red, Gold and Khaki colours, please contact us for samples. 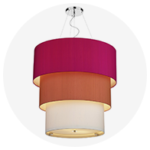 The Heskith drum lamp shade can be supplied as a shade only to retro fit an existing drum shade pendant or with various suspension options to suit your particular project. 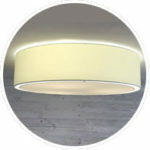 Our ribbon drum lampshades is suited to both home and commercial settings, for more information on trade supply, please see below or visit our trade area. As with all of our handmade drum lamp shades please allow 3 weeks for delivery. 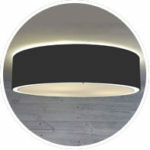 popular drum lampshade colours include our chic black drum lampshade or contrasting white drum lampshade, both of these shades classic contemporary interiors. For a splash of colour why not try a Red drum lampshade or Blue drum lampshade. How about adding warmth to your decor with a vibrant orange drum lamp shade rather than playing it safe with a cream drum shade. 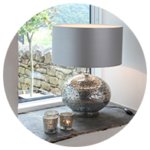 One of the most popular drum lampshade colours at the moment has to be our grey drum lamp shade, check it out here.